Yoel and Jeff discuss the Sanhedrin: Its nature, its origin, its authority and its recent ruling about the New Moon sighting by two witnesses. Also, the extremely significant contributions of Rabbeinu Chananel, Rif, Rashi and the Ba’alei HaTosafot. In episode 16 of the Oral Torah series, Yoel and Jeff talk about authority. Where is this described and to whom is it given? In episode 15 of the Oral Torah series, Yoel and Jeff discuss the period between the Talmud and the Geionite. In particular, the Karaite answer to the Rabbinic position. Episode 14 of the Oral Torah Series begins with a look at who has the right to talk about or criticize Judaism. Then Yoel and Jeff discuss the time following the formulation of the Babylonian Talmud, covering several of the main players (savoraim, gaonim) during this timeframe and what they did to enhance the writings. Thank you for bearing with the technical difficulties of this episode. Most of Jeff’s interaction has been removed to limit the distractions. 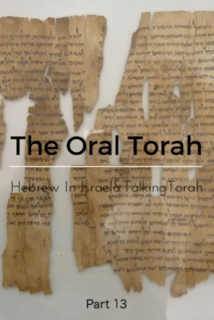 In our 13th episode of the Oral Torah Series, Yoel and Jeff begin the discussion on the time after the writing of the Talmud; a time of great arguments about the writing of the Oral Traditions.